I found a disused structure with a roof out back of the Madura Roadhouse. I never miss an opportunity to camp under cover. The evening temperature on the Nullarbor can get really low, below the dew point, which in practical terms means waking up cold in a wet tent, not that night, small pleasures. Crawling out of my coffin like crib in the early hours of Saturday morning to marvel once more at those heavenly stars, just me and the quite hum of the diesel generator. Cold without a cloud in the sky and a building nor-westerly, the cycling gods were benevolent. With The Boomerang shaped Hampton Tablelands at my right and the Roe Plains on my left, I pumped out a good cadence. Kangaroos, scrubbies (wild cattle) along with some majestic wedge-tailed eagles, kept me company and as always a pair of pink galahs made an appearance (my personal totem birds). 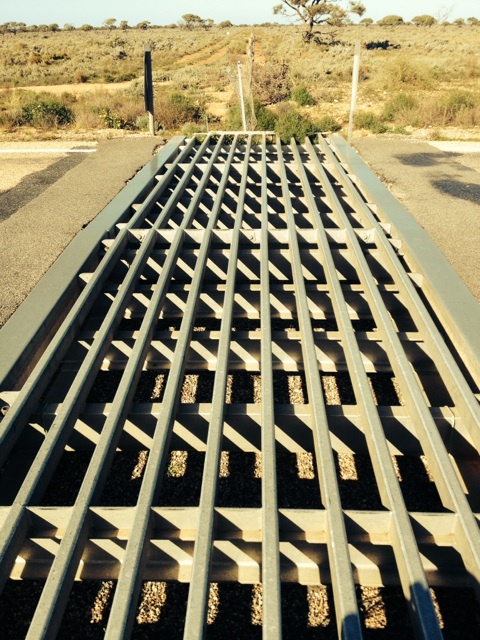 There are many warning signs out here on the Nullarbor: Beware of Road Trains; Beware of stray animals; Grid signs warn of cattle grids/ aka Bicycle Killers, I always get off and walk across them. Pilot cars with flashing lights warn of “Oversize vehicles” I get off the road and let the monsters pass. Aeroplane signs warn of, you guessed it Aeroplanes. 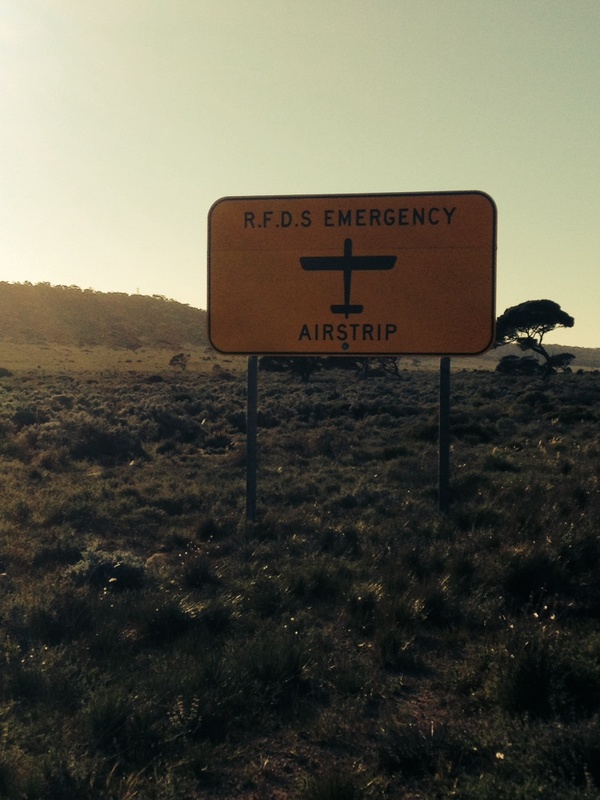 The Royal Flying Doctor Service uses sections of the Eyre Highway as an emergency landing strip. At times I’m riding on a marked out makeshift runway! The wind coming down off the tablelands is comforting and warm, carrying aromas of freshly roasted pumpkin, I think about food. There’s a pie shop at Numurkah in North East Victoria that makes a delicious cauliflower and cheese pie. “I will have two please” I say aloud to a bemused crow. The country opens up as the tablelands run away to the North, only to come back later. 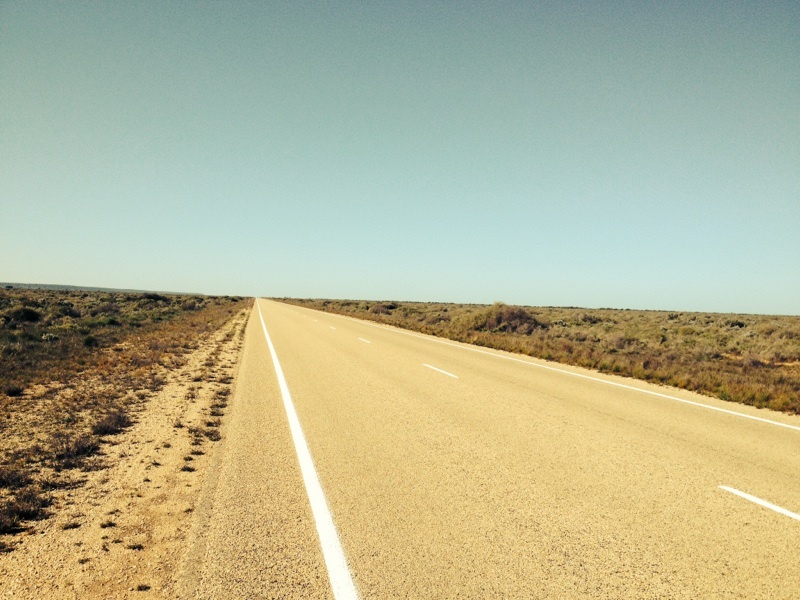 I feel I’m getting an extra large serving of the Nullarbor with all the trimmings today: The vastness, grandeur and isolation give rise to reflection. 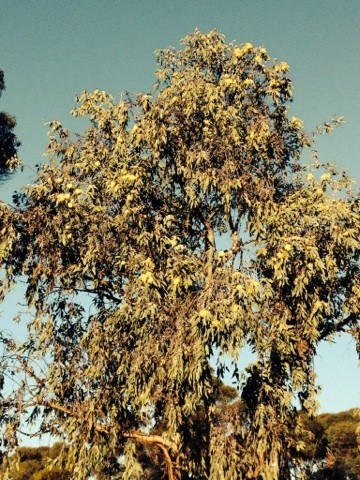 Traveling through this ancient land is exhilarating, that fresh Nullabor air is a tonic. “Taking the airs.” I drink it in, letting it wash over me. As a cyclist you don’t just pass through this environment, the very environment envelops you, permeates you, a type of transformative osmosis takes place. I have lost a couple of kilos but gained something else, the knowledge that I belong out here, in Australia. No water but 2 kinds of salt? “Surprise me” I said – she didn’t. Still no sign of the ‘Ships of the Desert’ but my own ‘Iron horse’ is traveling well, festooned with drying clothing, bits of rope, towels, extra water, octopus straps etc, we begin to resemble a traveling laundry. All going well , I should cross the boarder into South Australia at some point on Sunday. A bit suspicious that both showers and no drinking water were available.